Queens Taste 2013 is on its way! Looking for a good place to taste all the best food in Queens? The Queens Taste 2013 has you covered. The event, which takes place on Tuesday, May 14th, will bring together food and drink vendors from across the borough in a tasting and networking event. Every type of food imaginable will be there—from Mexican to Peruvian to Trinidadian to Italian to hot dogs. Of course, there will also be drinks galore. Wine, beer, and liquor will all be presented from vendors both within Queens and outside of it. The event will be MC’d by Steve Hofstetter, which is sure to bring at least a few chuckles in. Hofstetter co-owns LIC’s Laughing Devil. There will be clowns among the attendees as well, performing tricks and entertaining guests. All in all, it should be a fun event for everyone—networker or not. About 1,000 people are expected to attend the event, which costs $125 per person or $225 per pair. 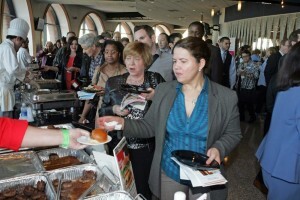 Among the sponsors for Queens Taste 2013 are The Mattone Group, Fairway Market, ConEdison, Citi and many more. QEDC, a nonprofit group that works to attract and maintain jobs in the Queens area, is putting on the event with lead sponsors Citi and Fairway Market. They hope to provide a friendly atmosphere for entrepreneurs and businesspeople to exchange ideas. This year’s event will be themed “Sandy Recovery,” which is particularly pertinent because the huge storm destroyed not only homes and buildings—but also jobs. Fairway Market was one business that managed not to lay off any employees even though it had an entire store destroyed.